If you haven’t already been convinced that cardboard witchcraft is behind these build-and-play kits, allow the Nintendo Labo Toy-Con 03: Vehicle Kit to suspend your disbelief. There is an undeniable magic to the whole experience that never fails to spark – colourful but otherwise mundane-looking cardboard sheets slowly being assembled in astounding ways to create something that you would never have believed to be possible. The Nintendo Labo Toy-Con 03: Vehicle Kit (£59.99 / $69.99) is the same price as the Nintendo Labo Toy-Con 01: Variety Kit and, while there aren’t as many as six Toy-Con contraptions to construct, the more targeted scope results in a package that best delivers on the new way to play that Nintendo Labo has opened up. Your whole experience with Nintendo Labo continues to follow the routine Make, Discover and Play pattern. You will first have the chance to warm up with the Joy-Con Holder – practising popping out unwanted bits, folding firmly along the fold lines and showing tabs some respect. After that simple creation has rocketed into the stratosphere, you will move on to the real thing. The Toy-Con Pedal (60-90 minutes) and Toy-Con Key (15-30 minutes) are your next challenges to tackle before you are able to choose to build the Toy-Con Car (150-210 minutes), Toy-Con Submarine (60-120 minutes) or Toy-Con Plane (30-60 minutes). The build time estimates that Nintendo has calculated could see the Nintendo Labo Toy-Con 03: Vehicle Kit’s construction take you as long as eight hours to complete, making it worthwhile to take regular breaks whenever the step-by-step instructions recommend that you do so – especially if you’re sharing the experience with someone that, whether young or old, has a shorter attention span. It helps that, along with the playful melodies that energise the experience, Nintendo Labo is a heartwarmingly friendly piece of software to interact with. Ready to encourage you when it knows that you will face a moment of doubt or even trying to make you laugh to lighten the mood when you’re repetitively assembling similar cardboard parts, it’s a companion on your journey to conquer every cardboard sheet to create something that’s truly remarkable. With each Toy-Con rapidly deconstructed before you must remake it, every interaction that you need to make with each cardboard piece has been animated. You have the ability to fast forward and rewind the instructions when needed, and, even for parents that will be keeping an ever watchful eye over their children, it’s hard to feel like you can go far wrong in the process. Now that your Toy-Con vehicles are assembled, it’s time for you to have some fun with them. There are minigames of sorts that are introduced as you build each Toy-Con, with Slot Cars becoming the first. This uses the Toy-Con Pedal and will be familiar to those that have ever hurtled toy cars around Scaletrix tracks. With increasingly difficult courses to race on, it’s all about judging how much pressure to apply to the pedal to score your fastest lap times while making sure that you don’t fly off the track. Circuit adds in the Toy-Con Car and shifts this experience to a first-person perspective, challenging you to outpace seven other racers. There’s a Smart Steering option here, too, helping to keep players of all ages from falling off the track much in the same way as in Mario Kart 8 Deluxe. Rally is a race against the clock, challenging you to drive through a sequence of gates placed around the Adventure map. It’s good to see all that open space used in this way, and you can unlock Hard Mode once you have cleared the 10 normal courses. And then there’s Battle, with which I couldn’t shake the comparison with BBC’s Robot Wars. This looks to be far more entertaining with two Nintendo Labo Toy-Con 03: Vehicle Kits, but can still be played solo. Two cars are placed in an arena and must use their robotic fists and power-ups such as bombs and lightning – to obliterate their competition. The need to lock the camera angle makes the action frantic if slightly clumsy, but that only adds to how entertaining it can be. But, these are mere distractions to the main event. It is in Adventure where you will undoubtedly spend the most time, a large open-world that’s broken down into 10 areas that each have their own challenges to overcome. You’ll carry a lamp back to the lighthouse that it fell from, shoot balloons from the sky, reunite cheerleaders nad rebuild a car wash. While these are simple to achieve and clearly targeted towards younger players, there’s enough breadth, character and surprises to entertain all ages. That comes in the scorpions in the Desert Area that playfully leap on your car and then taunt you, but also your interactions with the people, robots and animals that exist in this world that Nintendo has created – all represented as miniature toys. The magic comes in the freedom to swap vehicles, resulting in a Nintendo Labo experience that, really for the first time, actively encourages you to keep swapping between the Toy-Con that you have created. All you need to do is pull the Toy-Con Key from one and insert it into another, the Joy-Con’s IR Camera detecting what vehicle it has been placed into within seconds. You will need to play as the Toy-Con Car to top up your fuel, a process that, just like a real-life petrol station, will see you often overshoot when doing your best to line up your vehicle with the pump. The Toy-Con Car has more than a fuel hose, too, letting you use saws to cut down, hurl bombs, use windscreen wipers to clean the screen when it is splashed or simply tune in to the in-game radio. The Toy-Con Plane is the simplest to control thanks to the flight stick you can control, leaving you to soar through the skies where you can use rockets to shoot down balloons. I found the Toy-Con Submarine the hardest to control. Submerging to navigate beneath the waves requires that you turn wheels to redirect the two propellers attached to its sides. Point them both upwards and you will descend, downwards to ascend, behind you to move forwards and in front of you to propel yourself backwards. That’s simple enough to understand, but actually turning the vehicle was a constant frustration. In Discover, Professor Gerry Riggs greets you as the newest member of the Toy-Con Development Lab. With this semi-secret organisation, you will have the chance to work with the Professor who has a PhD in Fabrication Tech, resident programmer Lerna Lotte and Plaise Allatyme, who’s job is to play around with stuff to invent new kinds of games. Their mission is to build fun creations to entertain the whole world, and, if I’m being honest, I find this whole part of the Nintendo Labo experience endlessly fascinating. There is lighthearted comedy to your interactions with the three characters, as, along with short videos that help to make sure that everything is made clear, the writing is tremendous and packed with personality – while still remaining accessible to all. You have the chance to learn more about how the Joy-Con, IR Motion Camera, reflective stickers and rubber bands breathe life into making the whle experience possible – an IR Check-It-Out mode revealing the secrets behind how the Toy-Con work. Once you have read every topic in each section, you can then take a short quiz as your final exam to make sure that you have absorbed the knowledge that they contain. Your next pitstop is the Toy-Con Garage, the core control system of the entire Toy-Con Development Lab. This is an area where you have the chance to come up with new ways to play, taught how to use input, middle and output nodes to create your own Nintendo Labo experiences. This has already been used in incredible ways, whether that be a large game that revolves Toy-Con Dog or hunting Boos in a Luigi’s Mansion-inspired experience. I lack that practical creative thinking, but I am looking forward to seeing what the Nintendo Labo Toy-Con 03: Vehicle Kit will inspire. 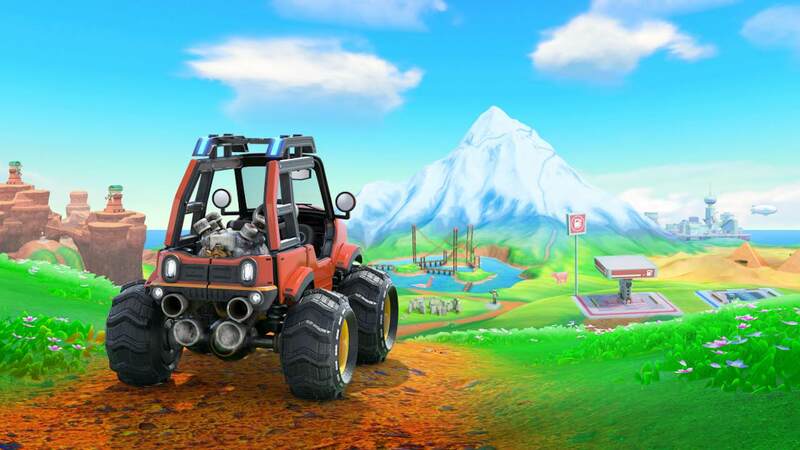 Nintendo has also added a Custom Controls mode, that encourages you to create your own Toy-Con contraptions to control the vehicles with. Which, I guess, should be seen as an extension to Toy-Con Garage.